The phablet sector of the smartphone market is getting larger all the time with a number of new handsets being released by a variety of manufacturers, and now the recently launched Nokia Lumia 1520 narrowly beats the Samsung Galaxy Note 3 in a poll. Once Nokia finally launched the Lumia 1520 comparisons were quickly made with the rest of the competition that is available in the smartphone market, and now a reader survey has found that more users prefer the new Nokia smartphone over the Galaxy Note 3. 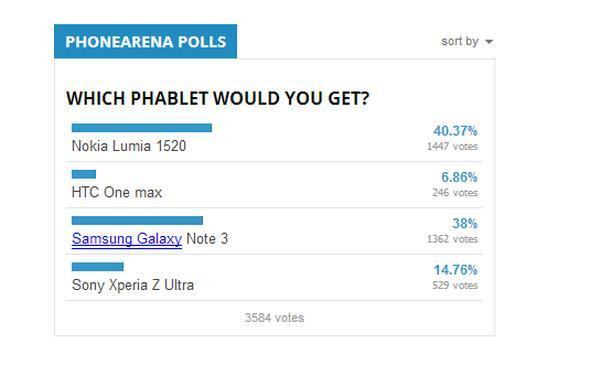 The poll over on Phone Arena asked its readers which of the new phablet devices that are now becoming available did they prefer, and the Nokia Lumia 1520 came out top just ahead of the Galaxy Note 3 with 40.37% of the total vote gaining 1,447 votes from readers. This compares to the Note 3 that achieved 38% of the total with 1362 votes from readers, while the Sony Xperia Z Ultra only managed 14.76% of the votes ahead of the HTC One Max that came in last on a miserly 6.86%. It seems that the larger sized HTC smartphone with its premium aluminium body and fingerprint scanner on the rear wasn’t enough to tempt people to vote for the device. There could be some put off the Nokia Lumia 1520 though after hearing about the possible price for the handset that we reported earlier. Smartphone ownership will always come down to personal choice with some people preferring features or specs that others are not too fussed about. Out of these handsets which one do you prefer?